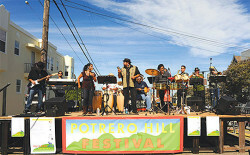 Potrero Hill, iconic neighborhood extraordinaire, is hosting the 28th annual festival – an exciting street fair on 20th Street. They’ll have music, food, crafts, rides and activities for young and old alike. Come celebrate the Potrero community and enjoy local food vendors and artists, musicians, historians, homegrown entertainment and much more.